As we're building the Earthwagon, many people ask us WHY we are building a tiny house. With everyone trying to navigate some type of debt, things can feel a little discouraging when it comes to home ownership. At around $250,000 (YIKES! ), the median cost of home ownership in the US is staggering with wage/job growth sluggish compared to inflation. If you throw into play the desire to live a sustainable/minimal lifestyle, it may feel like you run out of options fast. Blake and I were feeling that pressure. Add to that, all the aggravation of the ever-rising cost of apartment living and we were rattling our brains trying to figure out the next best move. We want to live a sustainable life with an ecofriendly home and plenty of fresh air. In all honesty, there are too many different reasons people decide to go tiny to name them all here, but I'll share here some of the main reasons people choose to downsize. Did you know that over the last 40 years, the average US house size has increased in size by more than 1,000 square feet? The typical square footage is now lingering around 2,687 square feet and building a home this size takes a lot of resources. With a tiny home, much less material is used and so you can easily incorporate reclaimed or sustainable materials into the structure. Larger homes are typically not very energy efficient, but when you build your own home you can make energy efficiency and green technology a priority. Utilizing solar and wind power in combination with tiny living can significantly reduce your carbon footprint. Most tiny homes use composting toilets and therefore don’t generate any black water. It is also easy to reuse your gray-water and be aware of your water usage when living tiny. When I think of all the “stuff and things” that we own, I get a little overwhelmed. One of the most exciting aspects of this project for me is that I get to sort through everything I have and keep the possessions that I find useful and meaningful, and donate the rest! Switching to life in a small space means reevaluating your lifestyle habitats and making changes accordingly. I know letting go can be hard, but I believe acknowledging that things are really just “things” and deciphering between need and want is critical for happiness. Ever since we found out about Baby Moore, I've been thinking about this a lot more. I want Baby Moore to recognize what is really important and not be so wrapped up in material consumption like too many people are today. Our children learn by example and I know choosing this lifestyle over any other is the best way to show our tiny human that less is truly more. Many people choose the tiny life so they can be on the move. With a tiny home, you can go wherever you please and possibly even work while traveling. A lot of us aren’t exactly sure where we want to settle, but tiny house communities are popping up all around the country! You can switch it up and always have a place to park your home. 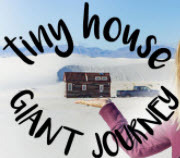 A lot of people love this aspect of tiny living, and if this is your main reason for going tiny I would suggest checking out Jenna, or "that tiny house girl’s" story at Tiny House Giant Journey. She built her own tiny and has traveled the country with it! As I mentioned previously, home ownership is expensive. A tiny home is a lot more financially attainable, and therefore can give you much more freedom. Freedom to think about all the time you'll save not having to keep up with such a large space. Freedom to pay off your home in years instead of decades. Freedom to move about. All in all, it means you can spend more time doing the things you love! Rather it be spending time with family and loved ones, traveling, pursing hobbies and passions, or maybe even helping others accomplish their dreams of tiny house living, you will not feel like your home is draining your time and bank account. Many people have also asked, “Why not just get an RV?” and the answer simply comes down to longevity. For one, our tiny home is built to last (RV’s are generally not designed for full-time living). We want our home to last a lifetime and you just can’t get that type of quality out of an RV. So, we designed the wagon with these things as priorities and had to sacrifice in other areas. Since we want to spend more time outdoors and plan on adding a large patio around the wagon, we decided that we could live without much indoor relaxing space. The reasons for minimizing your footprint are numerous and will vary from person to person. I believe that there is really no clear definition for “tiny house" and have heard from pioneers of the movement such as Dee Williams and Jay Shafer that “tiny” is different for everyone! If you know what your wants and goals are, having a home of any size that helps you achieve those goals is what it is all about!